“Blackburn Youth Zone wants to bring the town together this Christmas to support local young people and their families. 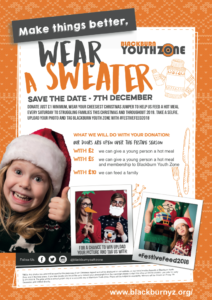 Schools and Corporates get the chance to wear their cheesiest Christmas Jumper on 7th December to raise money for Blackburn Youth Zone’s weekly ‘Eat Together’. ‘Eat Together runs at the Youth Zone every Saturday from 4:30 pm – 5:30 pm and provides hot meals for local families. If you wish to take part in Blackburn Youth Zone ‘Christmas Jumper Day’ please email melanie.thomas@blackburnyz.org or call 01254 292000.